Lumineers are owned, branded, and marketed by the company Den-Mat Corporation. They are made of a supposedly tougher porcelain. Lumineers are marketed with the promise that teeth do not need to be cut down for lumineers as would have to be done for all other porcelain veneers. 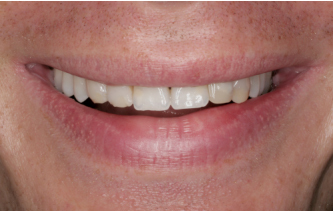 Lumineers require a minimum thickness of 0.3 mm, while all other porcelain veneers have to be at least 0.5 mm thick. This is only true for the porcelain areas that are entirely supported by underlying tooth structure. 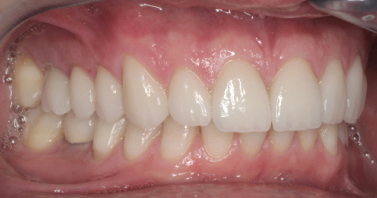 At the incisal edge, porcelain is less supported. Depending on desired improvements in proportions, length, shape, color, translucencies, youthful appearance, to mention only a few aesthetic aspects, specific designs of the tooth preparation would be required. A major drawback of lumineers is that their margins form a step where they meet the tooth. Since their minimum thickness is 0.3 mm, this step is clinically significant and can create staining, plaque accumulation, gum irritation, may be even gum disease or decay. 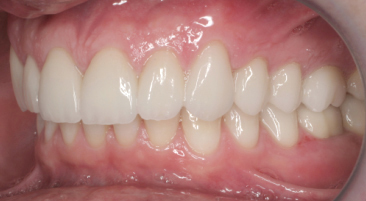 This patient had considered porcelain veneers for a long time. He had received many consultations with different dentists. He was very particular about his goals. He wanted to address all the flaws of his teeth while maintaining their natural appearance. The new porcelain veneers were designed very conservatively and addressed all his concerns. 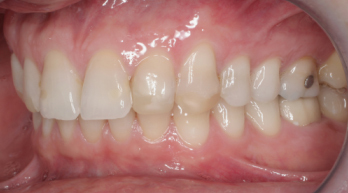 His teeth were stained and had multiple old composite restorations that had dulled on the surface. He wanted to make his teeth look a little "fuller" while maintaining the overall personality of his aesthetic zone. It was very important to him to have the progressive opening of the occlusal embrasures from the front to the back teeth. This was achieved from the central embrasure of the upper central incisors to the first molar. 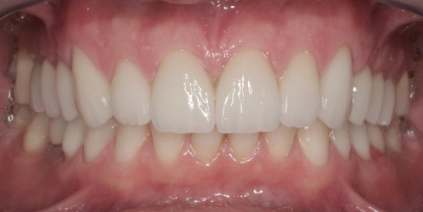 Ideally, porcelain veneers should have a smooth and undetectable transition to the tooth, behaving like a healthy tooth surface, minimizing the risk of bacterial colonization with all its consequences. In addition, any lumineer is bulky, which may be aesthetically compromising and leads to unnatural looking teeth. Lumineers limit the creativity of an experienced cosmetic dentist. 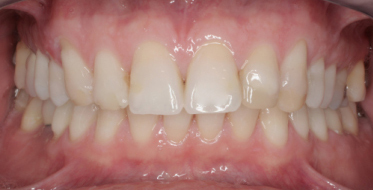 Besides the drawbacks of lumineers as outlined above, underlying tooth color may be either apparent or the surface porcelain has to be unnaturally opaque. Adding even just 0.3 mm to the thickness of a natural tooth makes it look bulky. In addition, they will have to be made about 2 mm longer. These elongated and too rounded lumineered teeth often cause other functional problems, such as discomfort of the lip above it. Many different porcelain systems are available, each of which addressing a specific aesthetic and functional concern. One should not be limited to one option, especially with the drawbacks as mentioned above. The preparation of a tooth depends on functional and aesthetic goals. As shown on this website, many aesthetic challenges exist, and can be addressed if the right porcelain system and proper preparation techniques are applied. The minimum requirement for any tooth preparation for a porcelain veneer should be the margin, which serves as the "receptacle" for the porcelain veneer. Besides this, tooth size, tooth color, tooth spacing, and tooth alignment would have to be perfect to even consider a lumineer. 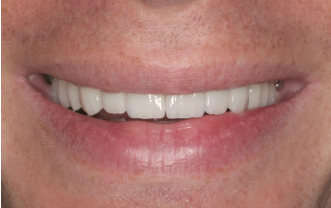 With minimum preparation, porcelain veneers can be more predictable, beautiful, and yet absolutely natural. Molina IC et el. 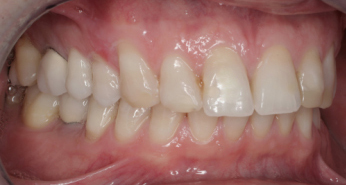 Partial-prep bonded restorations in the anterior dentition: Long-term gingival health and predictability. A case report. Quintessence Int. 2016; 47(1): 9-16.